Pew Research Center today released State of the News Media 2015, our annual report surveying the landscape of U.S. journalism, covering topics ranging from the changes driven by mobile devices to the ups and downs of legacy news organizations. Here are five key takeaways drawn from 13 media sectors we looked at. 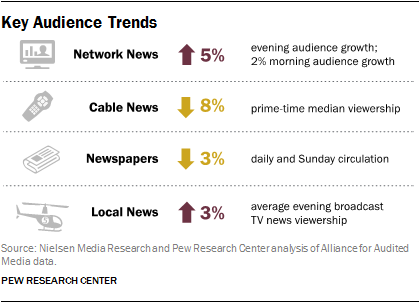 2Newspapers continue to struggle as an industry, but cable news also saw a significant decline. Combined median prime-time viewership for CNN, Fox News, and MSNBC was down 8% in 2014, according to Nielsen Media Research. Despite the audience drop, revenues were up 4%, according to SNL Kagan. Meanwhile, newspapers saw circulation decline by 3%, according to our analysis of Alliance for Audited Media data, and a BIA/Kelsey estimate showed advertising revenue was down 4%. Ad revenue is now less than half of what it was a decade ago and daily circulation is down 19% over that same period. 4One area with new momentum: podcasting. NPR reports that downloads of their podcasts were up 41% in 2014. The percentage of Americans who have listened to a podcast in the past month has almost doubled since 2008, from 9% to 17% by January 2015, according to Edison Research. And one-third of Americans ages 12 and over have ever listened to a podcast, up from 11% in 2006. 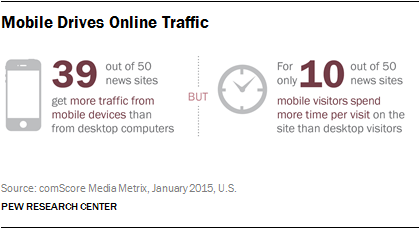 5Financially, the legacy news industry has made little progress in securing more of the digital dollar. Digital ad revenue across all media grew another 18% in 2014 from 2013, to over $50 billion, but traditional news outlets get relatively little of that pie. Instead, five technology companies took in half of all display ad revenue, with Facebook alone accounting for 24%.